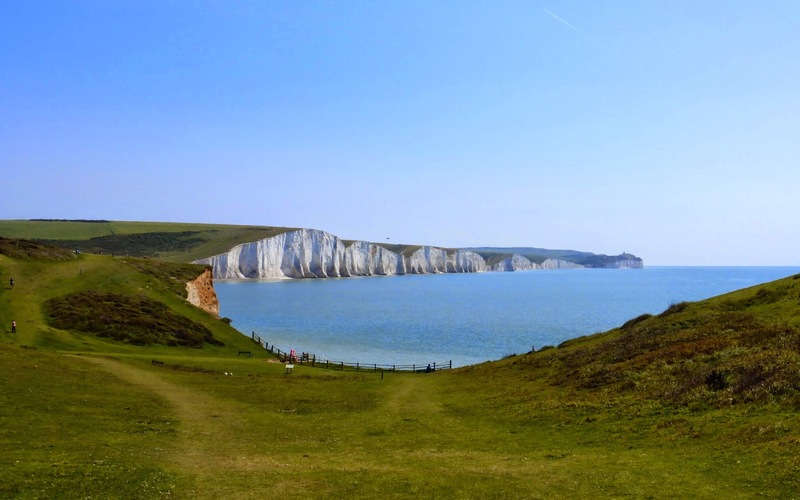 I hesitated about including this walk in my list of "walks from Brighton" - it's so famous and so obvious that it doesn't really need another plug. On the other hand, it must rank as one of the best bits of coastal walking in the country and it's just a local bus ride away from my front door. It was an easy but a last minute decision to do the walk. Roger, a friend from London, rang me the day before, pointed out that the weather forecast was great and said I should stop writing about the GR1 and go with him for a walk. We met on the platform at Lewes (my walks from Brighton rule - public transport only - is now even easier to comply with as we have sold our car) and got the train to Seaford to start the walk. Seaford was a port in the Middle Ages but suffered constant attacks from the French, and when the harbor silted up was largely abandoned. 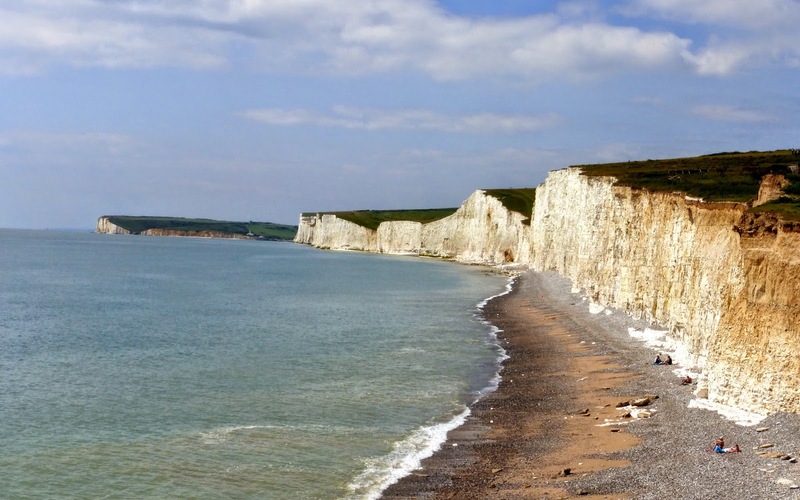 It revived in the 19th Century as a seaside resort but then lost its sandy beach when Newhaven built a breakwater to protect its harbour (Seaford's beach had been supplied with sand from longshore drift). It is now a quiet little town dominated by huge chalk cliffs immediately to the east. We joined the coastal path at the Martello Tower, one of 103 built along the southeast coast to keep out the French during the Napoleonic Wars, and set off east and up the cliff to Seaford Head. 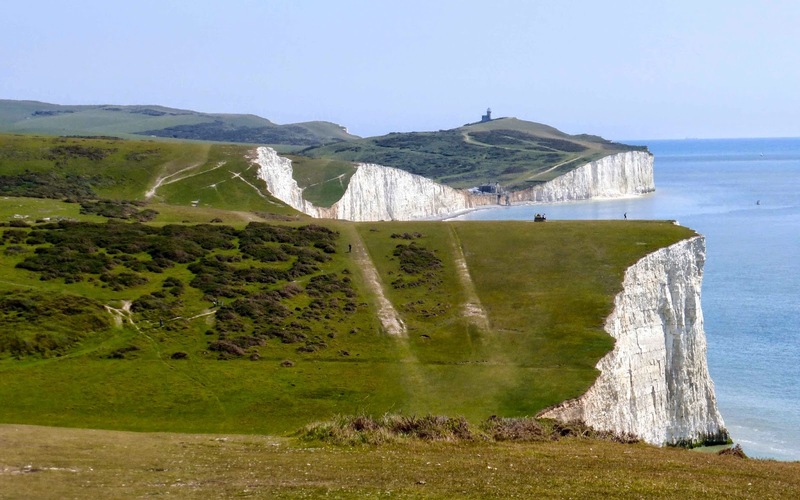 It's an 80 metre chalk cliff and it's lovely walking underfoot, nearly always dry, and the views when you get to the top across the famous Seven Sisters are amazing. The route drops down to Cuckmere Haven and you go just in from the shoreline along what must have been an old dry valley. Cuckmere Haven is a wonderful place and the coast guard cottages, with the Seven Sisters as backdrop, present a photo-opportunity which I guess everyone takes. It's also the setting for numerous films (Atonement is my favourite) and television dramas (7-39 a recent example) with the cottages providing the perfect place for a romantic escape. The Haven itself was seen as a likely landing spot for a German invasion in the Second World War and the remains of defences are scattered about. There is a memorial to Canadian Troops who, encamped there, were strafed by the Luftwaffe. More recent invaders include Little Egrets (Roger and I saw one as we headed inland and around the river) who made their first UK foothold here in what is a very rich nature reserve owned by the National Trust. After crossing the road bridge we head south, back towards the sea and up onto the Seven Sisters themselves. It's a Thursday but its May, the sun is out and this is one of the most popular stretches of walking in the country so we are not exactly on our own. The walking is still fabulous, huge views and with each of the Sisters to climb a good workout. The cliffs, which often used as a stand-in for the White Cliffs of Dover, took a huge battering in this year's winter storms with great chunks dropping off into the sea. We stopped for lunch at the Birling Gap, at the new National Trust restaurant (the pub has gone) and then set off up the hill towards Beachy Head. 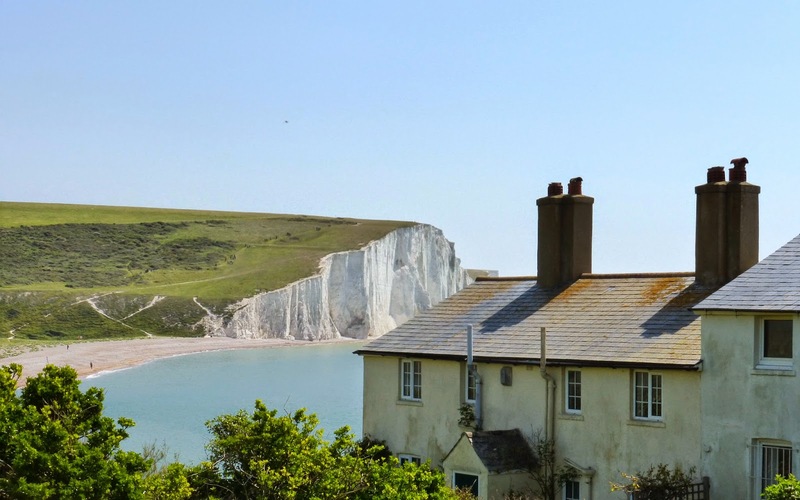 Once past the old lighthouse, now a house and moved inland to save it from erosion, and climbing Beachy Head itself, the views west with the Seven Sisters, Seaford Head and Brighton in the distance are fantastic. Today we shared them with what must have been several coach loads of German schoolchildren who of course looked indistinguishable from their English counterparts. 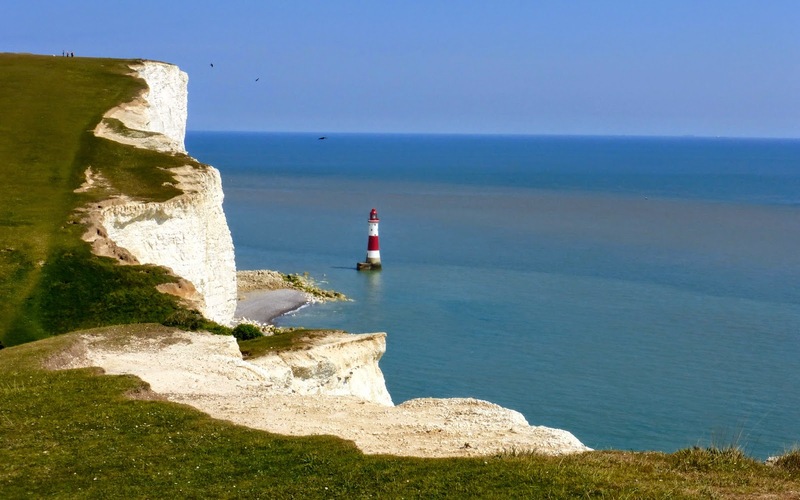 Beachy Head, another important south coast film location, is, of course a famous suicide destination (20 a year) and where Gloucester in King Lear is tricked into thinking he has committed suicide. Despite this it looks particularly nice with the lighthouse at the bottom of the cliff looking fetching after a new lick of paint. After Beachy Head it's a steep descent down into Eastbourne, a smaller and much less edgy version of Brighton. After a couple of pints of Legless Rambler, courtesy of the Beachy Head Brewery (you couldn't make it up), it's on the train and back home. Great day's walk and thanks Roger for the idea. 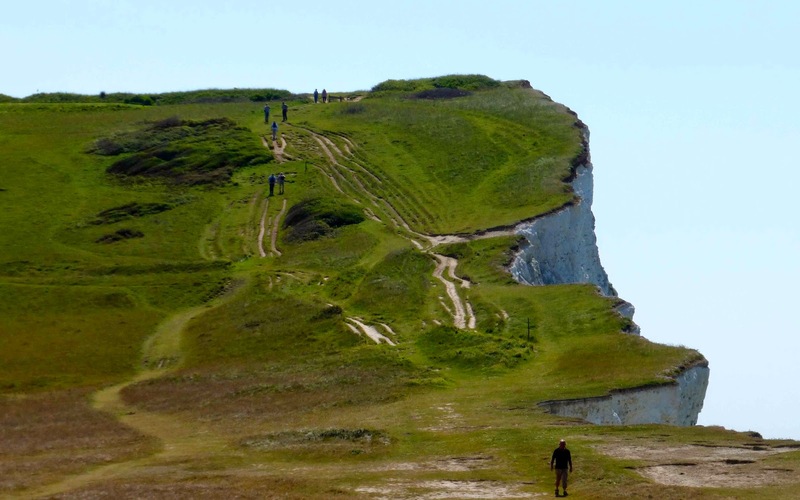 A great walk which brought back for me memories of a winter trip along the South Downs Way.